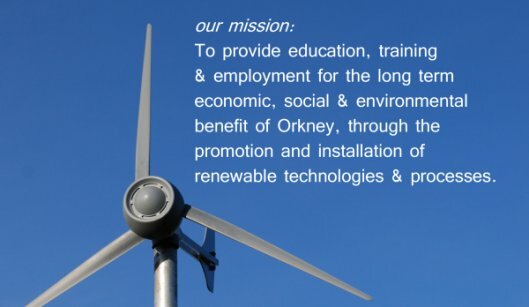 Orkney Micro Renewables (OMR CIC) is a Community Interest Company set up by five residents on Eday. This structure has been selected as all directors have a strong belief and history in structures for community benefit. The use of a CIC structure & the associated “asset lock” ensures the benefits from the company remain in Orkney for the benefit of all residents & holds the company to our social and environmental objectives & values. Our aim is to build a sustainable, long term, viable social enterprise that will reduce the high incidence of fuel poverty found in Orkney, reduce householders’ carbon output and help educate and inform people as to reducing energy usage. The provision of quality training & employment opportunities on the north isles and mainland will help ensure the longer term social & economic sustainability of the north isles. We firmly believe that access to affordable renewable energy should be available to everyone and are dedicated to achieving this.